GeoNet reported that the Mud Rift feature at Okataina's Waimangu Geothermal area erupted during 17-20 May, the first time since 1989. The Mud Rift geothermal vent formed in 1906 in the Raupo Pond Crater (one of multiple craters which formed in June 1886) and is 36 m long, 5-6 m wide, and 15 m deep. The steam-driven events mostly ejected fine sand and mud, and there was abundant evidence of fluids flooding into the rift, especially at the W end. Nearby vegetation was brown, and there was some evidence of collapse around the edges of the vents. A short but intense sequence of earthquakes occurred in the Lake Rotomahana area of the [Tarawera] rift on 16 November. The largest event (ML 3.8) occurred at 1835, in the middle of the sequence; events continued until about 2000. A geodetic survey of the Lake Rotomahana strain monitoring pattern was completed ~20 minutes before the earthquake sequence commenced. 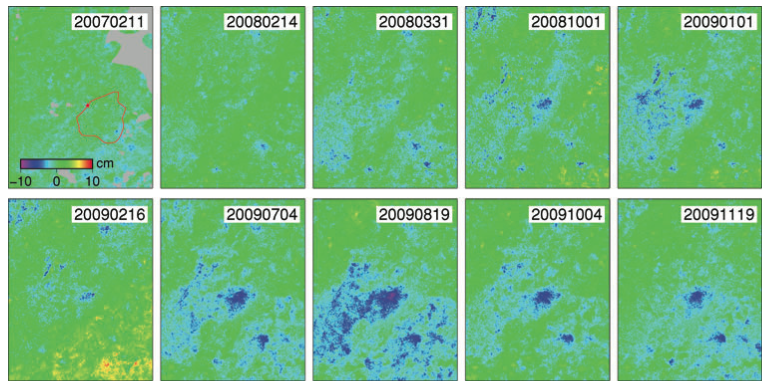 Selected stations were reoccupied three days later but no significant co-seismic deformation was detected. All the earthquakes appeared to be of tectonic origin. Similar swarms were recorded 22-23 February 1986 and in February 1983. The 17-km-long Tarawera Rift was the site of a vigorous eruption in 1886 that ejected ~0.7 km3 of basaltic magma in ~4 hours (Nairn and others, 1986); large phreatic explosions occurred from Lake Rotomahana, which has grown substantially since that eruption. Phreatic explosions have been recorded  times between 1896 and 1973 in the [Waimangu] thermal area to the SW, along the rift. Reference. Nairn, I.A., Cole, J.W., Houghton, B.F., and Wilson, C.J.N., 1986, Tarawera 1886 eruption: International Volcanological Congress Handbook, 1-9 February 1986, p. 111-121. Information Contacts: B. Scott, NZGS Rotorua; S. Sherburn, DSIR Geophysics, Wairakei. A series of shallow earthquakes occurred 23-29 September a few kilometers SE of Haroharo Dome, in the Okataina Volcanic Center (figure 1). The main earthquake was at 1423 on 23 September. A foreshock preceded it by about 3 minutes, and three of the four large aftershocks followed at 1429, 1440, and 1452 (table 1). Many other aftershocks were recorded, the last at 0530 on 29 September. Figure 1. Map showing the Haroharo Volcanic Complex and part of the Tarawera Volcano in the Okataina Volcanic Center. From Cole and Nairn (1975). Table 1. Earthquakes of M > 2.5 recorded in the Okataina Volcanic Center during 23-29 September 1982. I.A. Nairn, working on the N side of Tarawera Volcano (~11 km S of the epicenters) on 23 September, felt shocks and heard rockfalls nearby. He estimated the Modified Mercalli intensities of the foreshock and main shock as IV, and of the aftershocks at 1440 and 1452 at III-IV. He described the ground vibrations as low-frequency but relatively large-amplitude. Other nearby NZGS personnel noted the relatively low frequency of the felt shocks compared to typical local felt earthquakes. Observers noted that although they did not feel the shocks strongly outdoors, houses and vehicles resonated to large-amplitude vibrations. A small seiche was recorded on the N side of Lake Tarawera (7-8 km SW of the events). Three tilt networks around Tarawera Volcano showed no significant changes. J.H. Latter placed the hypocenter for the 27 September event [at 38.129°S, 176.531°E, figure 1] about 5 km SE of Haroharo Dome at a depth of about 2 km. Nairn reported that this location coincides with a small area of surface faulting and geothermal activity. The 23 September earthquakes could not be located because of the lack of any nearby seismic records, but epicenters were estimated to be within 6 km of the 27 September event. Latter noted that the slow propagation of energy from the earthquakes and the low frequency of the felt shocks might suggest that they were "roof rock" events generated by activity in an underlying magma body. However, no volcanic tremor was detected during or after the earthquake sequence. Although Haroharo has not been historically active, five eruptions in the last 10,000 years have been dated by 14C or tephrochronological methods. Very large explosive eruptions occurred roughly 2,050, 2,850, 5,050, and 7,050 years before the present (BP). Dome extrusion occurred at 2,450 years BP (± 400 years). Information Contacts: J. Latter, DSIR, Wellington; I. Nairn and B. Scott, NZGS, Rotorua; P. Otway, NZGS, Wairakei. The massive, dominantly rhyolitic Okataina Volcanic Centre is surrounded by extensive ignimbrite and pyroclastic sheets produced during multiple caldera-forming eruptions. Numerous lava domes and craters erupted from two subparallel NE-SW-trending vent lineations form the Haroharo and Tarawera volcanic complexes. Lava domes of the Haroharo complex, at the northern end of the Okataina Volcanic Centre, occupy part of the 16 x 26 km Pleistocene Haroharo caldera, which formed incrementally between 300,000 and 50,000 years before present (BP). The oldest exposed rocks on the caldera floor are about 22,000 years old. 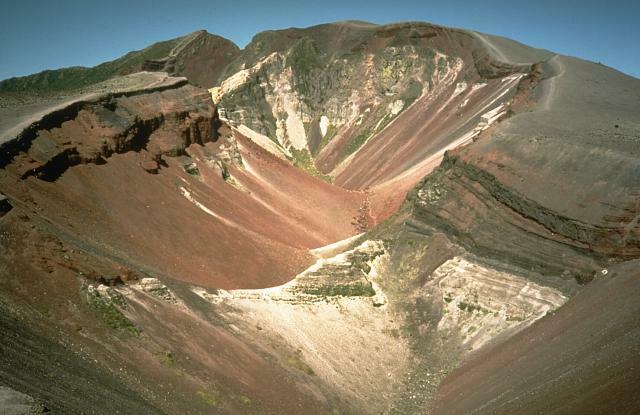 The Tarawera complex at the southern end of Okataina consists of 11 rhyolitic lava domes and associated lava flows. The oldest domes were formed as late as about 15,000 years BP, and the youngest were formed in the Kaharoa eruption about 800 years BP. 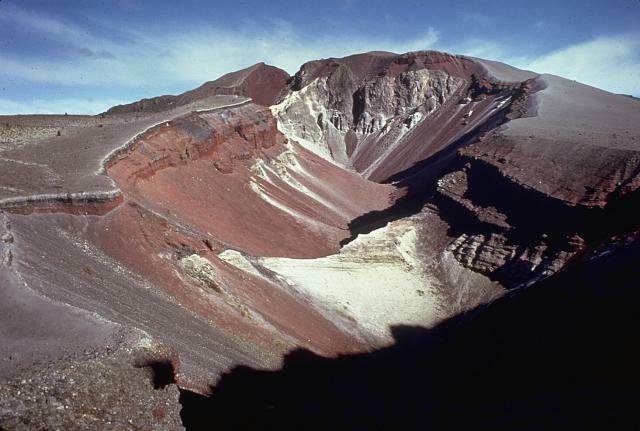 The NE-SW Tarawera vent lineation extends from the two dacitic cones of Maungaongaonga and Mangakakaramea on the SW to Mount Edgecumbe on the NE. 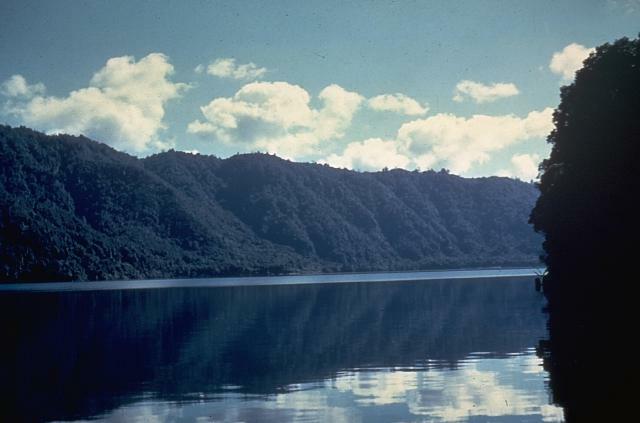 Construction of the Haroharo and Tarawera complexes impounded lakes Rotoiti, Totoehu, Okataina, and Tarawera against the outer margins of the Okataina ring structure. A major hydrothermal area is located at Waimangu; the world-renowned Pink and White Terrace siliceous sinter deposits were destroyed during the major basaltic explosive eruption of 1886. Alloway B V, Pillans B J, Carter L, Naish T R, Westgate J A, 2005. Onshore-offshore correlation of Pleistocene rhyolitic eruptions from New Zealand: implications for TVZ eruptive history and paleoenvironmental construction. Quat Sci Rev, 24: 1601-1622. Darragh M, Cole J, Nairn I, Shane P, 2006. Pyroclastic stratigraphy and eruption dynamics of the 21.9 ka Okareka and 17.6 ka Rerewhakaaitu eruption episodes from Tarawera Volcano, Okataina Volcanic Centre, New Zealand. New Zeal J Geol Geophys, 49: 309-328. Houghton B F, Wilson C J N, Del Carlo P, Coltelli M, Sable J E, Carey R, 2004. The influence of conduit processes on changes in style of basaltic Plinian eruptions: Tarawera 1886 and Etna 122 BC. J. Volcanol. Geotherm. Res., 137: 1-14. Houghton B F, Wilson C J N, McWilliams M O, Lanphere M A, Weaver S D, Briggs R M, Pringle M S, 1995. Chronology and dynamics of a large silicic magmatic system: Central Taupo Volcano Zone, New Zealand. Geology, 23: 13-16. Jurado-Chichay Z, Walker G P L, 2000. Stratigraphy and dispersal of the Mangaone Subgroup pyroclastic deposits, Okataina volcanic centre, New Zealand. J. Volcanol. Geotherm. Res., 104: 319-383. Jurado-Chichay Z, Walker G P L, 2001. The intensity and magnitude of the Mangaone subgroup plinian eruptions from Okataina volcanic centre, New Zealand. J. Volcanol. Geotherm. Res., 111: 219-237. Leonard G S, Cole J W, Nairn I A, Self S, 2002. Basalt triggering of the c. AD 1305 Kaharoa rhyolite eruption, Tarawera volcanic complex, New Zealand. J. Volcanol. Geotherm. Res., 115: 461-486. Macpherson C G, Chiang K K, Hall R, Nowell G M, Castillo P R, Thirlwall M F, 2010. Plio-Pleistocene intra-plate magmatism from the southern Sulu Arc, Semporna peninsula, Sabah, Borneo: implications for high-Nb basalt in subduction zones. J. Volcanol. Geotherm. Res., 190: 25-38. Manning D A, 1996. Middle-late Pleistocene tephrostratigrapy of the eastern Bay of Plenty, New Zealand. Quat Internatl, 34-36: 3-12. Nairn I A, 1989. Mount Tarawera. New Zeal Geol Surv, 1:50,000 geol map sheet V16 AC and 55 p text. Nairn I A, 1991. Volcanic hazards at Okataina Volcanic Centre. New Zeal Ministry Civil Defense, Volc Hazards Inf Ser, 2: 1-29. Nairn I A, Cole J W, 1975. New Zealand. Catalog of Active Volcanoes of the World and Solfatara Fields, Rome: IAVCEI, 22: 1-156. Nairn I A, Hedenquist J W, Villamor P, Berryman K R, Shane P A, 2005. The ~AD1315 Tarawera and Waiotapu eruptions, New Zealand: contemporaneous rhyolite and hydrothermal eruptions driven by an arrested basalt dike system?. Bull Volcanol, 67: 186-193. Nairn I A, Self S, Cole J W, Leonard G S, Scutter C, 2001. Distribution, stratigraphy, and history of proximal deposits from the C. AD 1305 Kaharoa eruptive episode at Tarawera volcano, New Zealand. New Zeal J Geol Geophys, 44: 467-484. Nairn I A, Shane P R, Cole J W, Leonard G J, Self S, Pearson N, 2004. Rhyolite magma processes of the ~ AD 1315 Kaharoa eruption episode, Tarawera volcano, New Zealand. J. Volcanol. Geotherm. Res., 131: 265-294. Sable J E, Houghton B F, Wilson C J N, Carey R J, 2006. Complex proximal sedimentation from Plinian plumes: the example of Tarawera 1886. Bull Volcanol, 69: 89-103. Shane P, Hoverd J, 2002. Distal record of multi-sourced tephra in Onepoto Basin, Auckland, New Zealand: implications for volcanic chronology, frequency and hazards. Bull Volcanol, 64: 441-454. Shane P, Martin S B, Smith V C, Beggs K F, Darragh M B, Cole J W, Nairn I A, 2007. Multiple rhyolite magmas and basalt injection in the 17.7 ka Rerewhakaaitu eruption episode from Tarawera volcanic complex, New Zealand. J. Volcanol. Geotherm. Res., 164: 1-26. Shane P, Smith V C, Nairn I A, 2005. High temperature rhyodacites of the 36 ka Hauparu pyroclastic eruption, Okataina volcanic centre, New Zealand: change in a silicic magmatic system following caldera collapse. J. Volcanol. Geotherm. Res., 147: 357-376. Spinks K D, Acocella V, Cole J W, Bassett K N, 2005. Structural control of volcanism and caldera development in the transtensional Taupo Volcanic Zone, New Zealand. J. Volcanol. Geotherm. Res., 144: 7-22. Spinks K D, Cole J W, Leonard G S, 2004. Caldera volcanism in the Taupo Volcanic Zone. Geol Soc New Zeal, New Zeal Geophys Soc, 26th New Zeal Geotherm Workshop, 6th-9th Dec 2004, Great Lake Centre, Taupo, Field Trip Guides, 7: 110-135. Vandemeulebrouck J, Hurst A W, Scott B J, 2008. The effects of hydrothermal eruptions and a tectonic earthquake on a cycling crater lake (Inferno Crater Lake, Waimangu, New Zealand). J. Volcanol. Geotherm. Res., 178: 271-275. White J D L, Houghton B F, Hodgson K A, Wilson C J N, 1997. Delayed sedimentary response to the A.D. 1886 eruption of Tarawera, New Zealand. Geology, 25: 459-462. Wilson C J N, Gravley D M, Leonard G S, Rowland J V, 2009. Volcanism in the central Taupo Volcanic Zone, New Zealand: tempo, styles and controls. In: Thordarson T, Self S, Larsen G, Rowland S K, Hoskuldsson A (eds), Studies in Volcanology: The Legacy of George Walker. Geol Soc London, p 225-247. Wilson C J N, Houghton B F, McWilliams M O, Lanphere M A, Weaver S D, Briggs R M, 1995. Volcanic and structural evolution of Taupo Volcanic Zone, New Zealand: a review. J. Volcanol. Geotherm. Res., 68: 1-28. Wilson C J N, Rogan A M, Smith I E M, Northey D J, Nairn I A, Houghton B F, 1984. Caldera volcanoes of the Taupo volcanic zone, New Zealand. J. Geophys. Res, 89: 8463-8484. There is data available for 31 Holocene eruptive periods. Remarks: Long-term subsidence is associated with the Kawerau geothermal field. Time series of line-of-sight displacement at Kawerau geothermal field from ALOS PALSAR ascending path 324 starting from 20061227 (date in YYYYMMDD format). Coordinates of top-left hand side (TL) and bottom-right hand side (BR) corners are (?37.95N, 176.60E) and (?38.15N, 176.80E). Red star shows region of fastest subsidence. From: Samsonov et al. 2011. Reference List: Samsonov et al. 2011. Samsonov S, Beavan J, Gonzalez P J, Tiampo K, Fernandez J, 2011. Ground deformation in the Taupo Volcanic Zone, New Zealand, observed by ALOS PALSAR interferometry. Geophysical Journal International, 187(1), 147-160. There is no Emissions History data available for Okataina. The Haroharo volcanic complex is the NW-most of two lava dome complexes forming the Okataina volcanic centre. A 16 x 28 km wide caldera was formed incrementally during eruptions between 300,000 and 50,000 years ago. Its rim, seen in this photo in the background across an infilling caldera lake, is generally obscured by a group of overlying lava domes. All post-caldera domes are less than 20,000 years old, and the most recent Haroharo eruption took place about 3500 years ago. Photo by Ian Nairn (Geological Survey of New Zealand). The 1886 Tarawera eruptive fissure, seen from the north, cut lava domes of the 800-year-old Kaharoa eruption. The rocks of the 1886 eruption, 20-30 m thick here, are red and black, and overlie white rhyolitic pyroclastic rocks of the Kaharoa eruption. This view shows a 2-km-long section of the 8-km en echelon fissure with gray rocks of the Ruawahia lava dome appearing at the far end. Photo by Bruce Houghton (Wairakei Research Center). The SE part of the fissure within Ruawahia crater reveals stratigraphy from the ca. 700 BP Kaharoa and 1886 CE eruptions. The 35-m-thick light-colored Kaharoa plinian deposits at the base are largely obscured by talus fans of scoria from above. The thick overlying bright red scoria is from phase 2 of the 1886 eruption. Above it is a thin black zone (phase 3) consisting of very widespread scoria fall. Phase 4 (at the top) consists of white rhyolitic blocks ripped off the walls during the vent widening in the last half hour of the 10 June 1886 eruption. The flat-topped Tarawera lava dome complex at the top of the photo to the NE is one of two large dome complexes forming the Okataina volcanic center at the northern end of the Taupo volcanic zone. 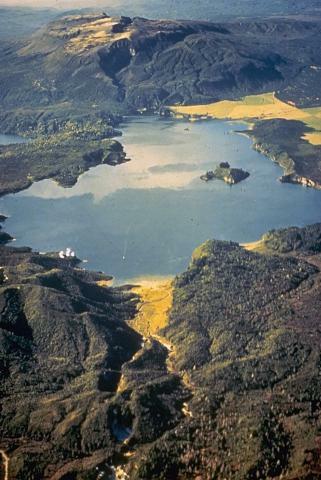 An eruptive fissure that cuts the dome complex and extends across Lake Rotomahana to the foreground was the source of a major eruption in 1886. The Tarawera complex and the Haroharo complex off the photo to the left were both sources of major explosive eruptions during the Pleistocene and Holocene that produced large ignimbrite sheets. Photo by Lloyd Homer, courtesy of Bruce Houghton (Wairakei Research Center). The 800-year-old Kaharoa eruption was the first Holocene eruption of the Tarawera lava dome complex. It produced an extensive rhyolitic airfall deposit that extended to the east coast of North Island. 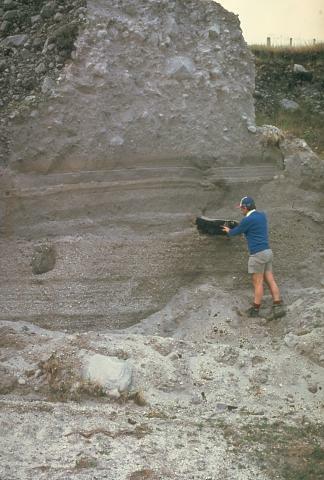 Geologist Pat Brown examines a charcoalized log within a pyroclastic-flow deposit from this eruption. The upper part of the section consists of blocky debris from collapse of a rhyolitic lava dome at the end of the eruption. Photo by Jim Cole (University of Canterbury). The steaming Waimangu cauldron is located near the southern end of the 1886 eruptive fissure. Intermittent phreatic eruptions took place from this and other craters south of Lake Rotomahana from 1886 until as recently as 1973. 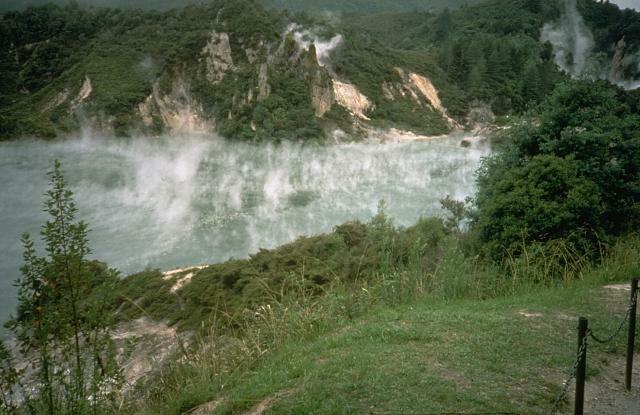 Waimangu (black water) geyser was spectacularly active from 1900 until it became extinct on November 1, 1904. 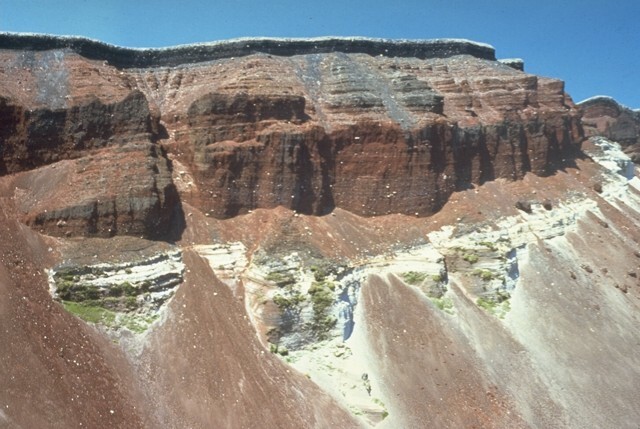 Photo by Richard Waitt, 1986 (U.S. Geological Survey). This large fissure system produced during a major explosive eruption at Tarawera in 1886 is one of the most dramatic features of the massive Okataina Volcanic Centre. Okataina is surrounded by extensive ignimbrite and pyroclastic sheets produced during caldera-forming eruptions. The subparallel NE-SW-trending Haroharo and Tarawera complexes consist of rhyolitic lava domes and associated lava flows that formed between about 15,000 and 800 years ago and impounded lakes against the margins of the Okataina ring structure. The following 20 samples associated with this volcano can be found in the Smithsonian's NMNH Department of Mineral Sciences collections, and may be availble for research (contact the Rock and Ore Collections Manager). Catalog number links will open a window with more information. Large Eruptions of Okataina Information about large Quaternary eruptions (VEI >= 4) is cataloged in the Large Magnitude Explosive Volcanic Eruptions (LaMEVE) database of the Volcano Global Risk Identification and Analysis Project (VOGRIPA).